Here we are. Irene and I, all smiles, embarking on a culinary adventure together. Irene hired me to prepare 2 weeks of dinners for her and her husband. Fully cooked, ready to heat & eat, and all healthy and delicious! We had a blast choosing recipes. Irene chose from a few of her favorites and also from The Healthy Edge online library that are all gluten-free and most are also dairy-free. This made it easy to put together a two week meal plan that is healthy AND delicious! Irene has a well-stocked pantry. We went through all the recipes and pulled spices, canned goods, condiments, etc. that she already had. She also sent me home with storage containers to bring back the food ready to heat & eat. Sicilian Bean and Potato Salad is one of Irene’s husband’s favorite side dishes. We chose it, but I realized later it wasn’t a good idea because it wouldn’t freeze well. Irene decided to make it herself because with her time freed up not worrying about dinner, she could make a side dish or dessert more easily. This Indian Curry recipe took the place of the bean and potato salad. I made it with pork (instead of chicken) and pearl barley (instead of orzo). It gave Irene more dinner options which is what she was really looking for. Back home, I wrote out what was still needed for each recipe. I also put them in order of what I thought is a good 2 week meal plan. From this list, I made the grocery shopping list. Irene already had a beautiful piece of salmon in her freezer so we worked that into the meal plan. What she needed was a marinade/glaze and we found the perfect recipe. All together Irene chose 6 dinner recipes, 2 side dishes and one breakfast. Broken down into individual servings, she and her husband would have dinners and a few lunches for two full weeks and then some! Irene wanted the flank steak and the salmon marinade for the first part of the meal plan so I delivered those uncooked. The Mediterranean Crunch salad was the prefect side dish for both of these entrees so I delivered that fresh also. Everything else went into the freezer. Moroccan Chicken with Lentils filled my kitchen with a delicious aroma! I took very few pictures while cooking. I was focused on getting everything done and delivered in about 3 days. I shopped on a Tuesday, cooked Wednesday and Thursday; and then delivered everything Thursday evening. Next time I’ll take more pictures. Irene’s freezer! It’s full of items she can pull out for dinner. Some are in individual serving sizes and some are in larger containers for multiple dinners. There’s even enough for lunches. If cooked food is frozen right away, it keeps for about 3 months. When thawed and reheated properly, it’s just as delicious as the day it was made. Barbecued Salmon was the second dinner in Irene’s meal plan. Since she no longer had an outdoor grill, she used her broiler pan and oven. This is a great option for anyone who doesn’t have an outdoor grill. She told me this salmon was tasty! Stress-free healthy meals on-hand = Peace of mind. What is this yummy looking dish, you ask? It looks like it’s wallowing in cheese and sauce, but it isn’t. I came across the recipe last summer. However, I didn’t make it last summer because of the crazy hot weather we had. This bakes for 40 minutes in a 400 degree oven! I saved the recipe because I’m attempting to add more veggies to our daily meals. I finally made it this winter and it turned out fantastic. My husband was extremely skeptical at first, but after a few bites he decided it was worth seconds. It reheats well so we got more than one meal out of it ~ love that! Serve it with anything you like. I served it with Trader Joe’s pre-sliced sirloin steak and that also made it a big hit with my husband. He asked me to make it again. Winner winner chicken dinner! How do you get more vegetables in your daily meals? Does mine ever look like hers? What do you do when you’ve planned to make a new dish for Thanksgiving, purchased all the ingredients, then run out of time to make it (because I insist on getting enough sleep)? You save the dish for after Thanksgiving. That’s what I did with this Farro Butternut Squash casserole. I’ve wanted to try Farro for a few months but the “right” recipe wasn’t showing up in my life until this one did. It’s part of Ina Garten’s “Make-ahead” menu for Thanksgiving that I found on Food Network’s website. I like the whole food ingredients. I like that I can use my homemade chicken stock. I like that Trader Joe’s sells butternut squash already cubed. I like that it includes bacon as a way to add flavor and make the dish more palatable to those whose appetites are not used to things like Farro. Other than cooking the bacon, it’s a one-pot dish. So many things to love. Here’s a few notes on what I did. • I used nitrite/nitrate-free bacon. • I used coconut oil in place of the butter. • I used 1/2 teaspoon dried thyme leaves (not ground) in place of fresh. • I put the bacon and the Dutch oven into my oven at the same time for the first 30 minutes. I did this based on reading the instructions all the way through. “Sweating” the onions and the other ingredients are ready. Applewood smoked bacon going into the oven. This is a great way to cook bacon! Place it on a cooling rack on top of a baking sheet. Simmering the farro in the chicken stock along with the onions. Butternut squash placed on top of the farro and ready for the oven. The chopped, cooked bacon and parmesan are placed on top after the first 30 minutes of baking. Enlarge the photo to see the parmesan 🙂 Do you think it looks like Ina’s? Mine took longer to absorb the liquid so it went back into the oven for another 30 minutes. I may have goofed and not bought “pearled” farro. Other than that, the flavor was fantastic! We had it for dinner with leftover turkey, then for breakfast with scrambled eggs. Yum! This recipe is a Trader Joe’s knock-off. I sampled it one day at my friendly neighborhood Trader Joe’s. After reading the ingredient list, I knew it was something I could make myself. And I did. I like how the yogurt adds creaminess, protein and makes it go further to feed a crowd. This amount works well for a potluck or party. It will keep for a day or two in your fridge but after that the color it turns is un-appealing. So… eat up! Dip a chip in it, spread it on a sandwich or burger, dollop it onto a salad or scrambled eggs, serve it as a side with beans & rice, and enjoy! If you are lucky enough to live near a Trader Joe’s you can purchase the original inspiration called Reduced-Guilt Guacamole Dip. Maybe you want to try it out this way before committing to making it yourself. Maybe you’re in a hurry to a friend’s BBQ party and you’re looking for a recommendation of what to bring. I’m partial to the homemade version since you get more bang for your buck and a way to use up those late summer garden tomatoes. Avocados: A great source of healthy fat that your body loves. Here’s a short video I did showing how to safely peel, pit and slice your avocados. 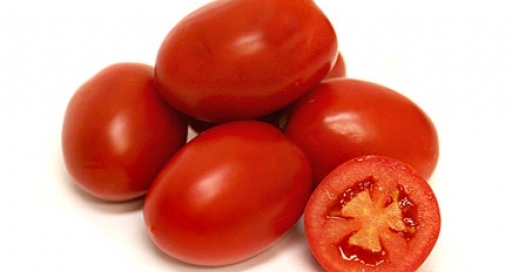 Tomatoes: I like romas. They’re less “juicy” so you get more tomato per pound. 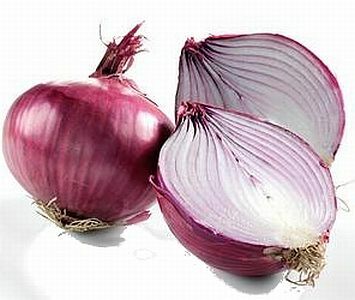 Red Onions: The darker the vegetable, the more nutrients and more flavor you can expect. Red onions are no exception. A little goes a long way to add color and flavor. Cilantro: Never has a humble herb caused so much controversy. Love it or hate it, it’s going to keep showing up in recipes. Ina Garten (The Barefoot Contessa) says it tastes like soap. 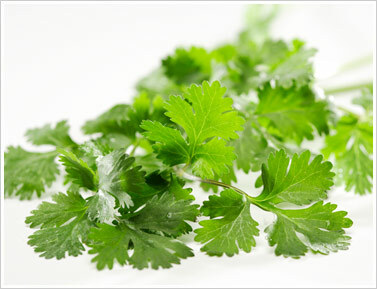 Trivia Tidbit: Cilantro are the leaves of the Coriander plant. Coriander seeds are ground up and used as a spice (see my hummus post) and the leaves, called Cilantro, are used as an herb. 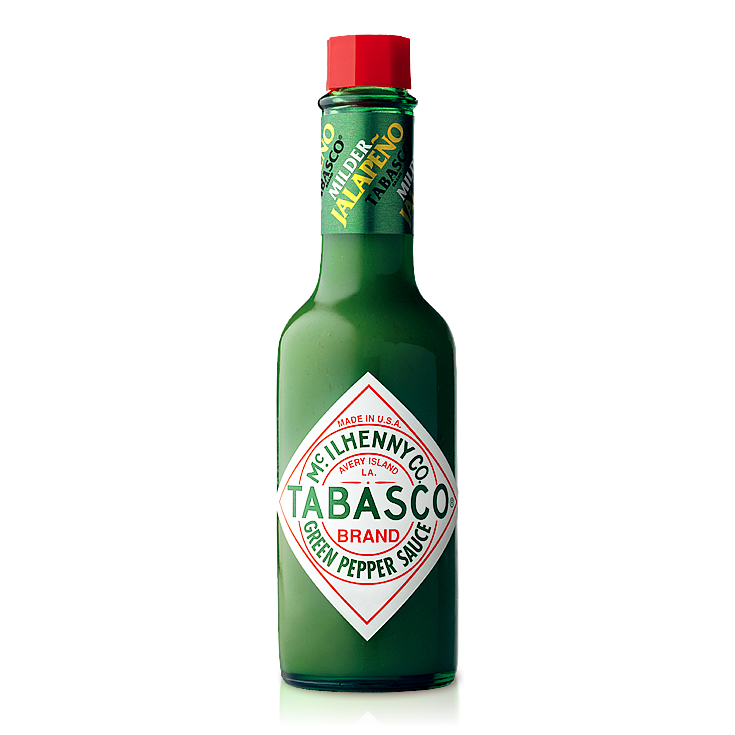 Green Tabasco: I really like this Tabasco option. It’s milder than the original and I believe it adds more flavor as well as a bit of heat that you would expect. I also use this in my Slow-cooker Chicken Soup (post coming this Autumn). 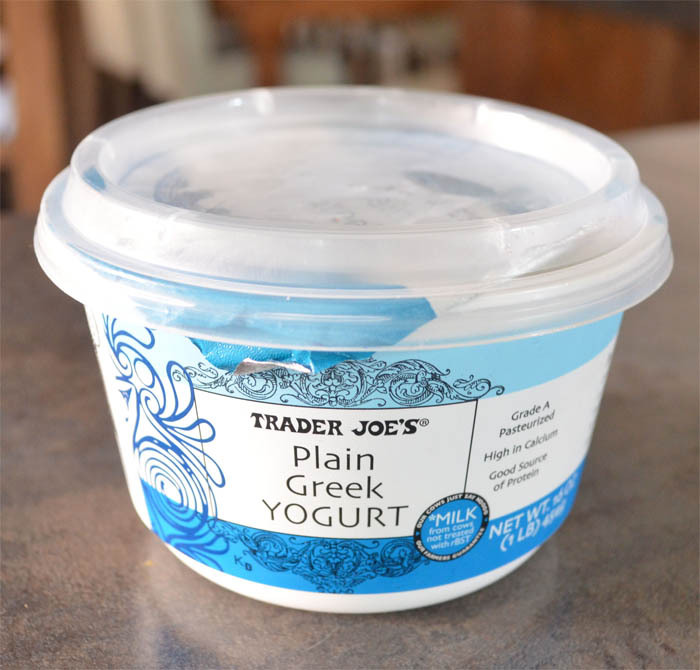 Greek Yogurt: It’s becoming more popular by the minute. Use it to replace sour cream or mayonnaise in dips and get extra protein with less fat. 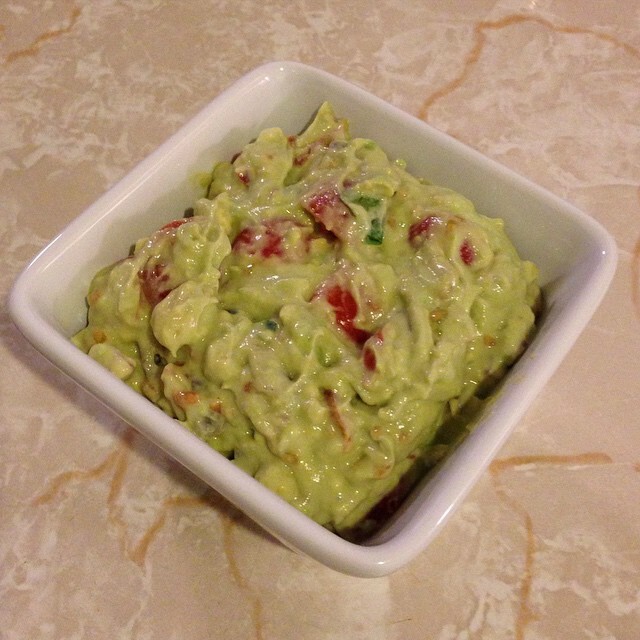 Place the diced avocados in a large mixing bowl and mash with a fork to desired consistency. Gently fold in the tomatoes, onion and cilantro. Place the rest of the ingredients in the bowl and gently fold in until combined. Serve immediately, or cover and chill in the refrigerator until ready to serve. When you think of guacamole, do you think of healthy eating? 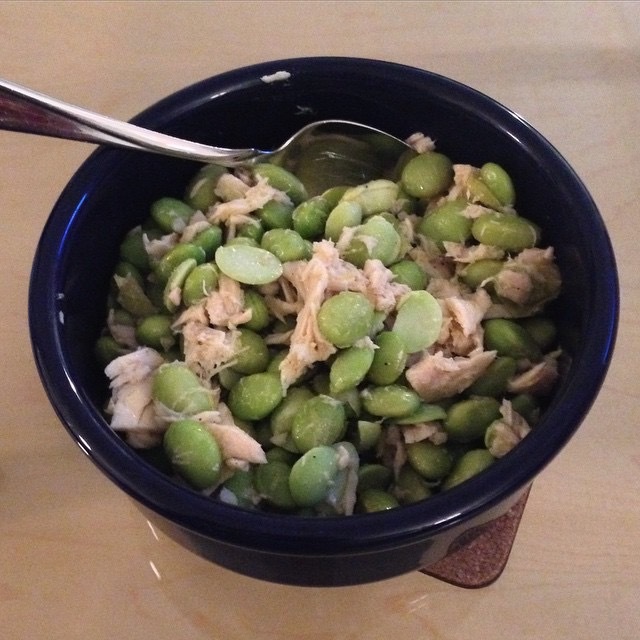 Edamame – it rolls on the tongue and bounces off the lips in a fun way. Exactly what is it? Immature soybeans. That sounds so judgmental. Let’s call them “baby” soybeans. They are a whole food, full of fiber, as well as an excellent source of vegetarian protein. 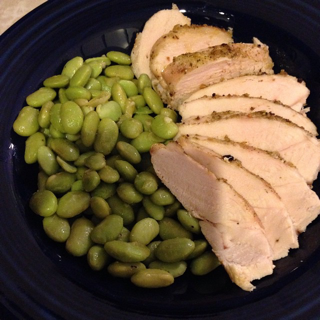 One cup shelled edamame has 10 grams dietary fiber and 33 grams protein. I choose to buy organic or non-GMO. 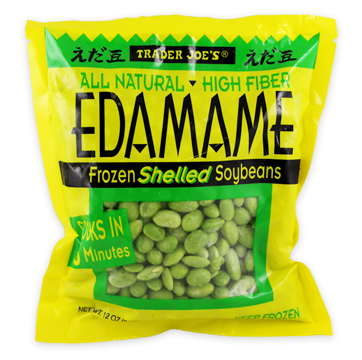 Trader Joe’s has frozen shelled edamame which saves the time of popping them out of their pods. Any item with the Trader Joe’s label is guaranteed to be free of GMO’s. Here’s a simple way to serve edamame as a side dish. I like it mixed with tuna or alongside baked chicken. It’s incredibly tasty, healthy and satisfying. 1. Steam frozen edamame in a steamer basket and place in a pot of water, making sure the water is under and not touching the steamer basket. Bring the water to a low boil and steam the edamame for 6-8 minutes. Transfer the edamame to a medium serving bowl. 2. To make the dressing, combine the lemon juice, mustard, garlic, salt and pepper in a small bowl. Whisk in the olive oil until emulsified. Pour the dressing over the beans and toss to coat. Serve at once, or cover and refrigerate until ready to serve, up to 2 days. 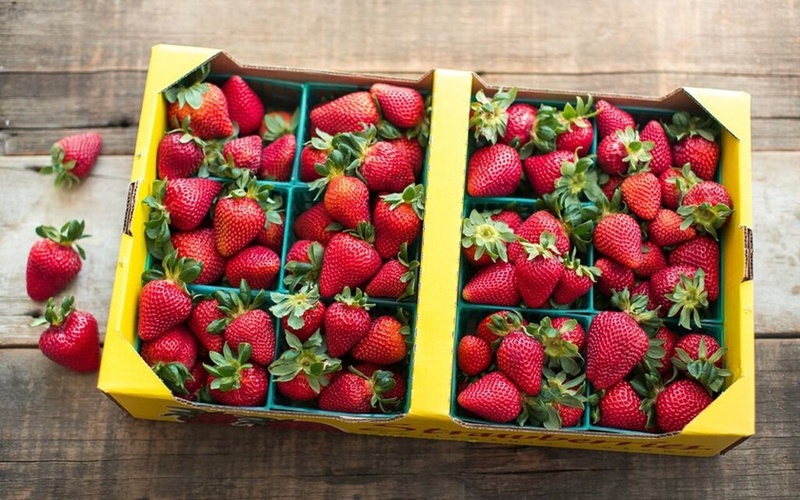 Here in the pacific northwest, nothing declares the arrival of summer better than fresh strawberries. Recently, one of my local grocery stores had a great deal on a flat of strawberries so I went for it. I knew we wouldn’t eat them all at once so I froze them using this simple method. 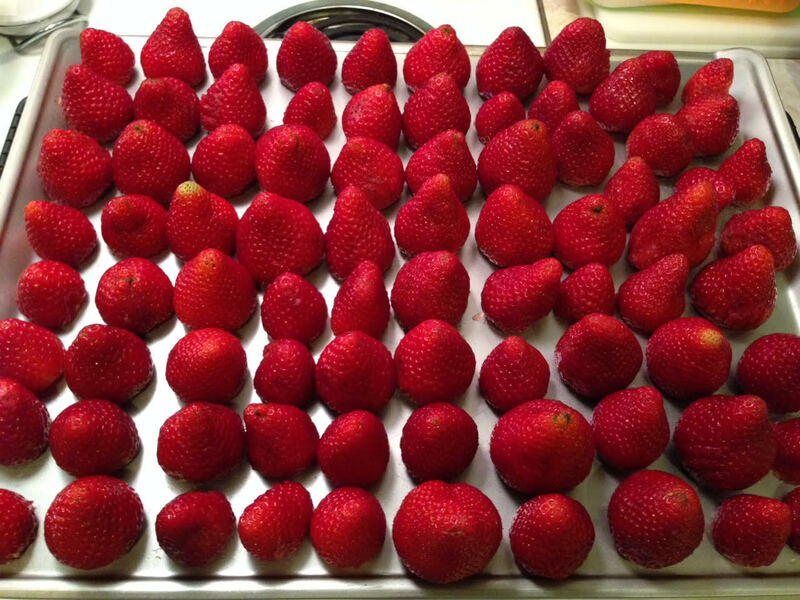 … and freeze them overnight. 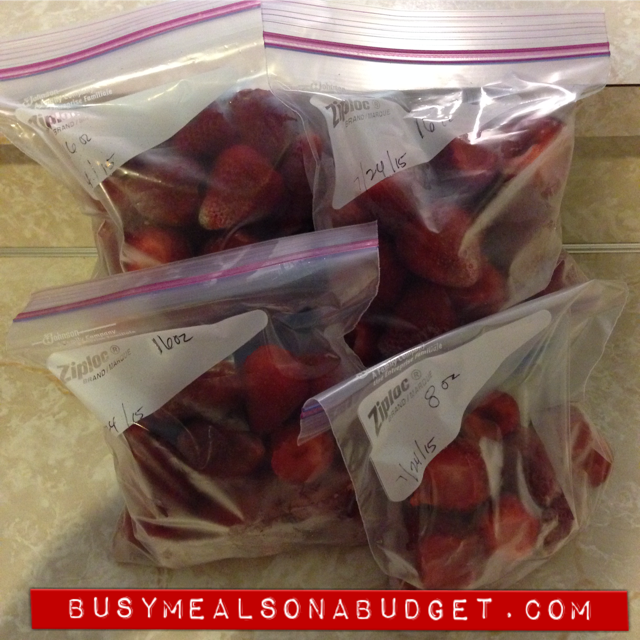 Store them in freezer bags so they’re ready whenever you are for a sweet treat. I like to label mine with the weight and the date. Have you seen those strawberry & banana “ice cream” recipes floating around Pinterest lately? Have frozen strawberries on hand lets you make that dairy-free “ice cream” any time you’re in the mood. I highly recommend it. Tell me, what would you do with a flat of strawberries? Plump up your oatmeal without plumping up yourself. It’s not the latest Pinterest craze… yet. What this is, is an excellent method for cooking up a big batch of oatmeal just the way you like it, and freezing it into portions without using up all your freezer containers or an entire box of small freezer bags. My first encounter with a truly big batch of oatmeal was through Hungry Girl. She has a recipe called “Growing Oatmeal Bowl”. The concept is to get twice as much volume from the same amount of rolled oats by doubling the liquid and the cooking time. What a great idea! Then she came up with a multi-serving version of the recipe. I was sold. 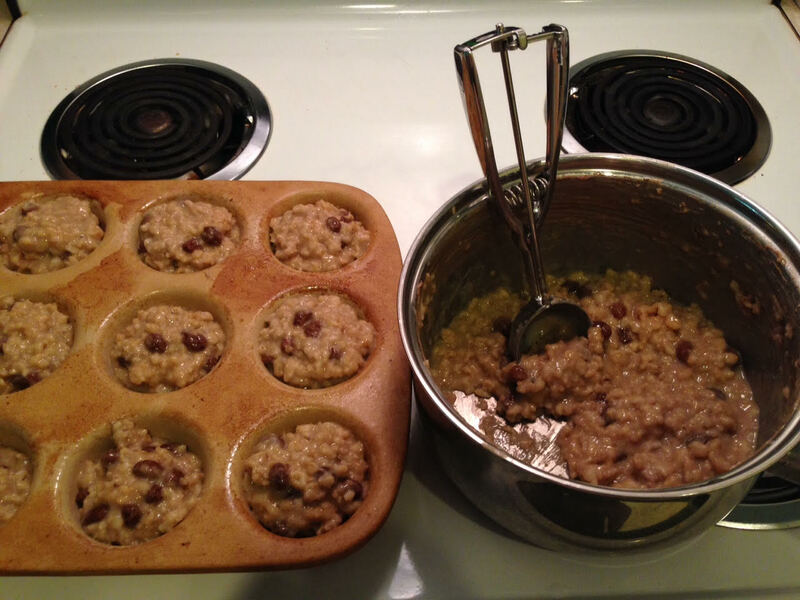 At the same time I came across an idea in my Cook’s Illustrated magazine for freezing oatmeal in muffin pans. Genius! Cook the oatmeal, let it cool a bit, scoop it into greased muffin pans and freeze it overnight. 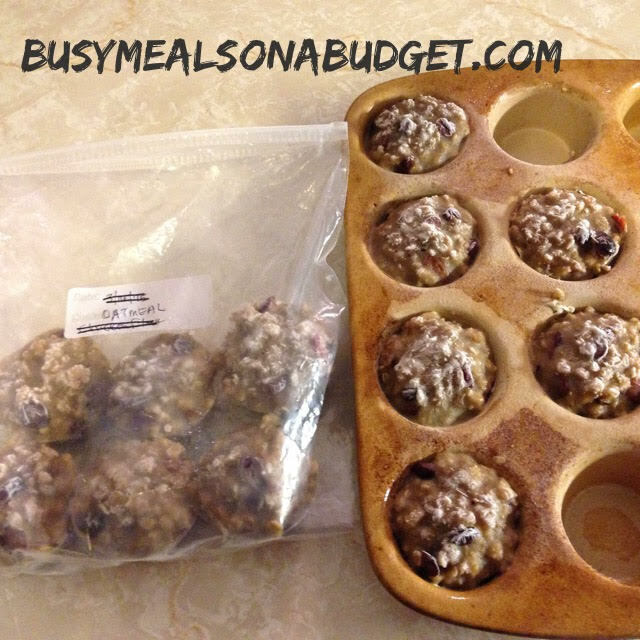 Another way to customize these is to press yummy bits into the top of each portion before freezing such as: granola, chopped nuts, coconut flakes, ground flax-seed, chopped apples, blueberries, etc. You’re only limited by your imagination! The next day, pop ’em out with a butter knife. If they’re really reluctant to pop out, let them sit out for about 10 minutes, then try again. But don’t let them thaw out too much or there’ll be too gooey to transfer to the freezer container. I always recommend labeling items with the date which is easy to do with a Sharpie directly on a gallon-size freezer bag. If you’re using a big Tupperware-style container, I suggest applying a strip of masking tape and writing on that with the Sharpie. 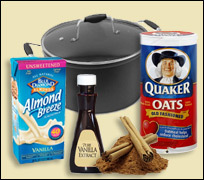 When you want oatmeal for breakfast, or any time of the day; choose one, two or three portions. Remember, it’s totally fine to have three of these. That’s the actual serving size! Re-heat in the microwave or on the stove top. You can even pack it for lunch! It’ll thaw out on its own and you can warm it up, or not. It’s better for you than fast food, that’s for sure. Recipe adapted from Hungry Girl’s Big Batch Growing Oatmeal Bowl. One serving = 1-2/3 cups. Makes 4 servings, or more if you have less than three portions at a time. 4 cups unsweetened vanilla almond milk (like Almond Breeze) or any type of milk you like, dairy or other. Optional Add-ins: granola, chopped nuts, coconut flakes, ground flax-seed, chopped apples, blueberries, etc. Combine all ingredients in a large pot, mixing well. Cook about 25 minutes, until thick and creamy, stirring often so it doesn’t stick to the bottom of your pot. If you like, serve yourself a portion right away. Pull the pot off the heat and let cool for about an hour, stirring occasionally. Press any “add-ins” onto the top of oatmeal. 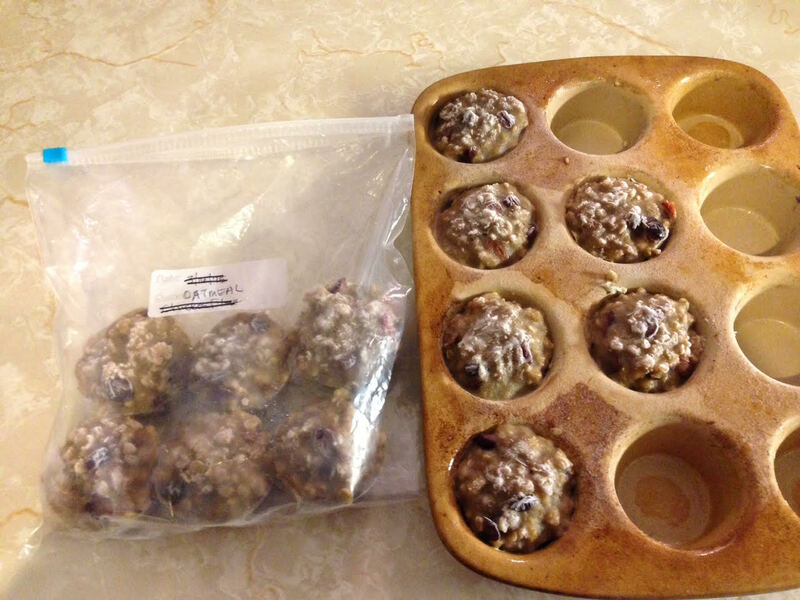 Transfer muffin pans to the freezer and freeze overnight. Using a butter knife, pop out the oatmeal portions and place in a freezer plastic bag or container. Keep these in the freezer until you’re ready for some awesome oats! *How many muffin pans you’ll need depends on the size of them. My metal muffin pans hold about 1/3 cup each. My stoneware muffin pan holds about 1/2 cup each. That’s why I use my stoneware muffin pan for these. What are some ways you make sure you have a good breakfast on hand every day?